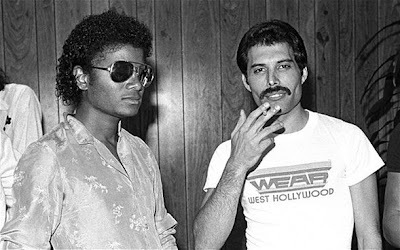 Three duets recorded by Queen frontman Freddie Mercury and Michael Jackson will be released this fall. The Times reports the demos were recorded in 1983 at Jackson's home studio, but a larger project never came to fruition due to the singers' conflicting schedules. "They were great songs, but the problem was time – as we were both very busy at that period," Mercury said in an excerpt from "Mercury: An Intimate Biography of Freddie Mercury". Queen manager Jim "Miami" Beach said that the pair of superstar singers had a falling out when Jackson brought a llama into the studio. "Mercury rang me and said: 'Miami, dear, can you get over here? You've got to get me out of here, I'm recording with a llama,'" said Beach. Queen guitarist Brian May is quoted as saying there will be "something for folks to hear" in two months time.